Rainbow flags will be flying Sunday from 36th Street and Fifth Avenue down the lavender line to Christopher and Greenwich Streets to top off Gay Pride Week, which started June 19. 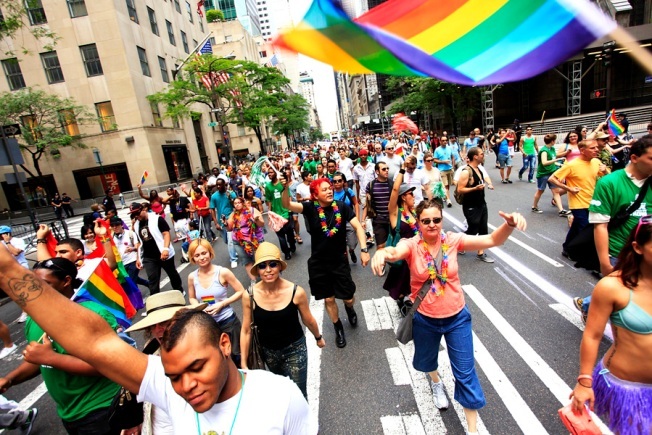 The Gay Pride parade will start a noon. It used to start at 52nd Street and Fifth Avenue but its route was shortened by 0.8 miles this year due to city budget issues, according to Heritage of Pride Inc., which plans the week’s events. This year’s judging and reviewing stand has also been bumped over to 9th Street and Fifth Avenue. Fran Rolan, senior co-chair of Heritage of Pride, said the shortened route will not diminish the importance of the parade. “We are more excited than ever to celebrate the fortieth anniversary of the first LGBT Pride March,” said Rolan. Most notably, the parade will still pass through the historic site of the Stonewall riots at 53 Christopher Street, where the gay rights movement was born. The first gay pride march took place in 1970 to commemorate the year anniversary of the clash gay activists had with police at the Stonewall Inn. Over 350 groups and 500,000 people are expected to participate in this year’s event. Lt. Dan Choi, a West Point graduate who served in Iraq but left active duty because of the military’s “Don’t ask, Don’t tell” policy, will join McMillen as co-marshal. Parade organizers say he will be the first openly gay male in the military to serve as a grand marshal in a lesbian, gay, bisexual, transgender pride march. Judy Shepard a mother who lost her son 21-year-old son, Matthew Shepard, in a hate crime in 1998 will be the third grand marshal.